UiNITED STATES DEPARTMENT OF AGRICULTURE Bureau of Entomology and Plant Quarantine Washington, D. C.
B. E. P. Q.--372 March 22, 1035. Announcement is made that the shiponing season for citrus fruit under the Federal Mexican fruit worm quarantine (Notice of Quarantine No. 64) from the counties of Brooks, Cameron, Hidalgo, and Willacy, in Texas, will close for the season on April 2, 1935. 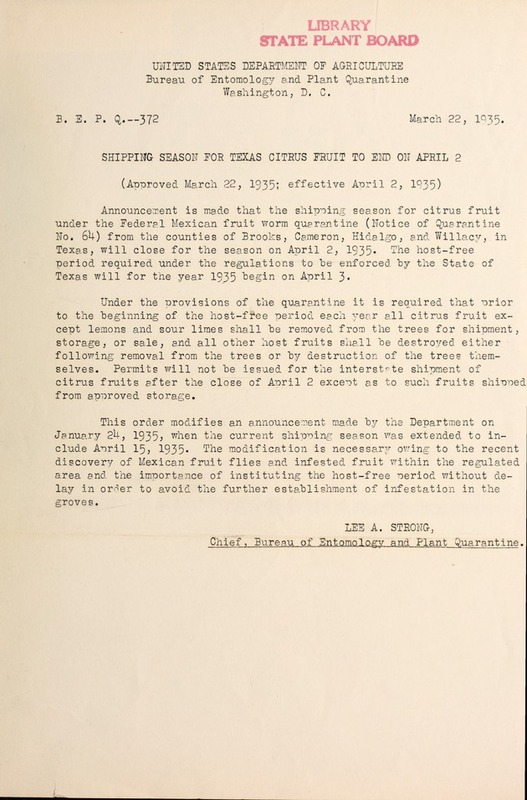 The host-free period required under the regulations to be enforced by the State of Texas will for the year 1935 begin on April 3.
citrus fruits after the close of April 2 exce-ot as to such fruits shined from approved storage. Chief, Bureau of Entomology and Plant qarantine.